You might already have heard that Yahoo! running a clean-up drive for unused Email accounts and making them available to the user who are keen to have it. Yahoo! is definitely one of the most loved Email service since a long. So you see there are number of people when introduced to this service, have registered an Email address there. And it seems a lot of them are not using that account anymore. As we know that the Email address must be unique, no one else can grab that Email account and have to use some prefix or suffix with their mailbox ID. Eg. Your desired E-Mail address is thinkerviews@yahoo.com, but as it is not available, you need to try thinkerviews1@yahoo.com or thinker.views@yahoo.com, or thinkerviews001@yahoo.com, or thinkerviews_2013@yahoo.com and so on… till your luck supports. Now this is pretty straight-forward situation in the normal scenarios. But, what if someone have just registered thinkerviews@yahoo.com and is not using it anymore since long? A genuine user who needs to use it, cannot use it, and the owner is not using it at all! Got the point?! So those who possess Yahoo! account and not using it regularly but wants to keep their account, needs to login an claim their Email address before the release is already complete. The last date to login into your account to retain was 15 July 2013! But there is the buffer time before the account will be released. So you can try logging in (or claim the same). We usually need to use Email address at various places to create an account, for example Facebook or Paypal. 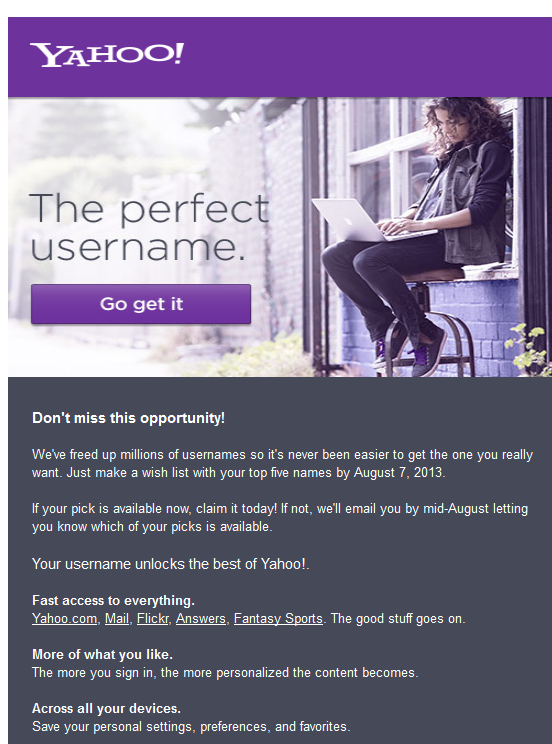 Now what if you possess such account and you have used your Yahoo Email address there. You might not be logging into your regular mailbox but using Facebook account for example? What if someone else claim that Email account and ultimately able to reset the password to get authority of your data posted at these sites? It is however a good step to free-up a lot of Email accounts and making them available to those who need them, the users needs to keep their eyes open and get regular updates from Yahoo’s official blog in the same regards. If you have a Yahoo Mail account which is not used regularly, either login and use regularly or simply login once, and remove all your personal stuff from the same and make sure there is no E-Commerce, Social networking account associated with anymore. What you think about this cleanup drive by Yahoo!